Nimble Streamer is designed and implemented to be very light-weight and fast. It consumes a very small amount of RAM and CPU to operate in compare to majority of other tools and servers. Since it's targeted to serve high load, there may be a point when Nimble exceeds its resources. An administrator needs to be aware of that to make scale up the infrastructure by either adding more CPU/RAM or adding more servers to pass the load. 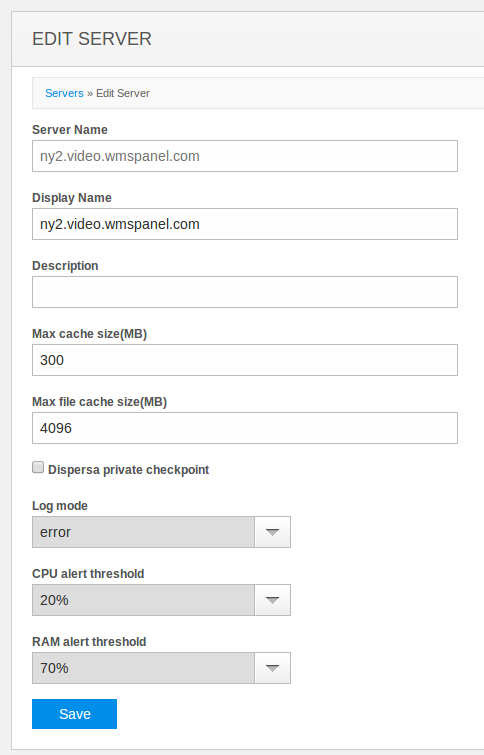 WMSPanel provides nice charts for CPU and RAM usage for each server so any moment a system admin may go to server details page and check what's going on. Now we've made next step and WMSPanel now allows setting up a level of CPU and RAM consumption to notify admins emails about resources overrun. The set up takes two steps. You need to define the thresholds for alerting an administrator. Click on Servers menu to go to servers list and click on Edit for designated Nimble server. Set up CPU and RAM limit to alert admin. Here you can select levels of CPU and RAM from the drop down list. Once the limit is reached, an email notification is sent to the emails which are set up on the step 2. These alerts will be sent once per hour if the consumption is still over the limit. To receive alerts you need to specify emails which need to be notified. Go to Control / Offline notifications set up menu to see the setup page. Set up email addresses for notifications. Here you will add or remove the email addresses and will be able to test them. Now if any of the limits is overrun, the email is sent out as described in "Define limits" section above. Contact us if you'd like to see more monitoring features in addition to described enhancement and Dispersa streams monitoring.